Did the Police Arrest This Man for Minor Traffic Violation, Fake His Suicide Only for Him to Survive & Challenge Their Claim? 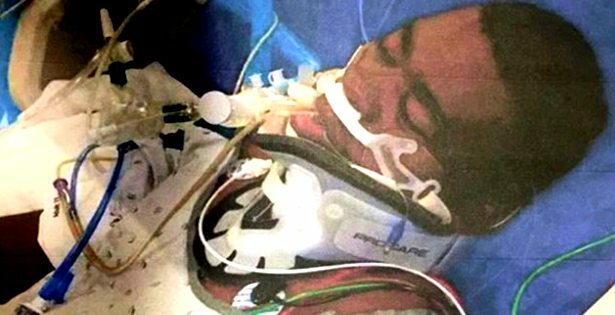 In a case that isn’t receiving much media attention, a 44 year old St. Louis man was jailed, refused medical services, and then woke up with doctors telling him that he tried to commit suicide. To say this case sounds a little strange is an understatement. Bernard Scott is the man at the center of this “suicide” case that has much of the informed population wondering just how much foul play was involved at the police station? Scott was jailed at the Pine Lawn jail in St. Louis for some traffic tickets. Doesn’t sound like much of a big issue. However, after Scott began complaining about having abdominal pain and bleeding, he was denied medical treatment. The jail supervisor on duty wouldn’t sign off on emergency medical treatment. Therefore, the injuries and bleeding persisted. At this time, it is unclear how Scott received the injuries or started bleeding. Many assume the police officers roughed him up, but that claim is unsubstantiated at the moment. 14 minutes later after the nearby Northeast Fire Protection District left the jail facility; another ambulance was called in because Scott’s condition got worse. [ADSENSE2]The police say they found Scott hanging by his neck with a shoelace that was tied to the door knob. Scott was taken to the hospital, where he survived. However, he doesn’t recall hanging himself. In fact, he said the police refused to let him leave until he posted his $360 bond for the traffic tickets. Naturally, the incident led to an internal review that hasn’t lead to any further progress. I know you are surprised, but something stinks…and it isn’t the fish. It seems like scenes like this are continuing to play out around the country when it comes to black men and women. Either they are trying to shake us down for addition fines and monies to float the police departments budget, quotas or they are trying to kill us and get away with it. What exactly is it going to take to get a federal investigation, shut down, and overhauling of the entire nation’s police state? SOUND OFF: What do you think of this case and why isn’t it receiving more attention? This is an ongoing situation,They dont care about black folks,This is why they refuse to publicize our stories,They love sweeping things under the rug ,When it comes to us.